The box and the tower. Donkey Kong Jenga is a Jenga game themed after the Donkey Kong arcade game and produced in 2008. Players have the option of playing either the original version of Jenga or the special Donkey Kong rules. For the special Donkey Kong rules, players must spin the wheel provided. The wheel indicates how many pieces must be removed from the tower. The wheel also determines how many levels the Mario game pieces climb. There are eight levels of girders to the top. The player whose Mario game piece first reaches Pauline without destroying the tower is the winner. 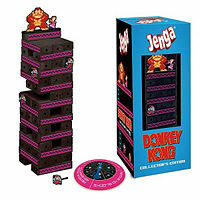 The Donkey Kong Jenga game includes 54 Donkey Kong girders (wooden blocks), four custom Mario game pieces, one custom Donkey Kong game piece, one custom Pauline game piece, a custom spinner, and the special Donkey Kong rules. This page was last edited on February 3, 2018, at 09:18.